Severe Flu Cases on the Rise in U.S. This year’s influenza season started earlier than expected and is sending more patients to the hospital, raising concerns this could be a more severe outbreak than in recent years. Thirty-six states are now experiencing high levels of flu activity, according to the Centers for Disease Control and Prevention in Atlanta, as this year’s flu vaccine may not fully protect against a strain known as influenza A H3N2 that is currently circulating and tends to be more severe. Fifteen children age 18 and under have died from the flu as of Dec. 20, compared with four such deaths around the same time last year, according to the CDC. A number of hospitals are outpacing previous years, with some restricting visitors to prevent the spread of the virus. “Our medical director said that in his eight years at the hospital, he had never seen double digits” in the number of patients hospitalized, said Jill Chadwick, a spokeswoman at the University of Kansas Hospital in Kansas City, Kan. It had a record 25 flu cases admitted as of Monday and two deaths. Dr. Anna-Kathryn Rye, a pediatric infectious disease specialist at Palmetto Health Children’s Hospital in Columbia, S.C., said the hospital is seeing two to three times the number of flu patients as in a normal season. “We are hoping this week will be the peak,” she said. The flu shot may not fully protect against the strain of influenza that is currently circulating around the U.S., according to the CDC. Distribution problems may be making it harder for some consumers to gain access to antiviral drugs given early in the illness. The CDC alerted pharmacies last week that there may be greater demand for these drugs earlier in the season. Agency officials said they have heard of anecdotal reports of a shortage of Tamiflu, a common antiviral medication. CVS Caremark Corp. said some of its pharmacies may have intermittent shortages of the liquid version of Tamiflu, due to the supplier’s challenges meeting demand. But CVS said there has been no shortage of the capsule version of Tamiflu, and patients can ask their pharmacist about having the capsule versions compounded into a liquid, spokesman Michael DeAngelis said. For patients of all ages, the hospitalization rate of flu patients so far is 9.7 people per 100,000 people in the general population, compared with 4.3 people per 100,000 last year and 5.5 people per 100,000 in the 2012-13 flu season. Dr. Michael Jhung, a medical officer in the CDC’s flu division, cautioned that it was too soon to say whether this will be worse than recent years. “We never know how this season compares to the previous season until the end of the year,” he said. This flu season has been dominated by the H3N2 virus, according to CDC. Vaccines configured in early February typically protect against three to four flu viruses, and this year’s included H3N2. However, the virus showed substantial changes, or mutations, in March. That means the vaccine, while still conferring some immunity, doesn’t work as well. H3N2 is associated with more hospitalizations and deaths. The last time the H3N2 strain of flu was widespread was two years ago, and this season’s rate of hospitalizations for people age 65 and older is already outpacing the rate for 2012-2013. CDC officials said that suggests this flu season might be more severe, although it may mean the flu is simply striking earlier. About 40% of Americans have been vaccinated for the flu, with 140 million vaccine doses distributed, said Dr. Jhung. Children under the age of 2, people age 65 and over, and people with chronic health conditions such as asthma are most at risk of severe illness from the flu. Between 5% and 20% of Americans get the flu, with 15 million to 60 million people afflicted each year. The CDC is still recommending that unvaccinated people get flu vaccines because they might provide protection and reduce severe outcomes such as hospitalization and death, officials said. Joel Sawyer, a 38-year-old political consultant in Columbia, S.C., was diagnosed with the H3N2 strain of flu last week and said he’d rarely felt so sick. David Weber, an epidemiologist at the University of North Carolina School of Medicine, said what differentiates this year is the spike in cases in mid-December and the flu’s relative severity. The UNC Health Care system, which includes the 800-bed UNC hospital complex in Chapel Hill and dozens of doctors’ offices and clinics, has had 323 patients test positive for flu so far this season. The majority are H3N2, the strain for which this year’s flu shot has proved “less than a perfect match,” Dr. Weber said. Patients, particularly very old or very young ones, are showing up more sick than they might be in an average year, he added. 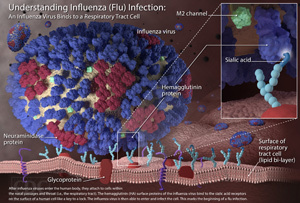 This image illustrates the very beginning stages of an influenza (flu) infection. Most experts think that influenza viruses spread mainly through small droplets containing influenza virus. These droplets are expelled into the air when people infected with the flu cough, sneeze or talk. Once in the air, these small infectious droplets can land in the mouths or noses of people who are nearby.